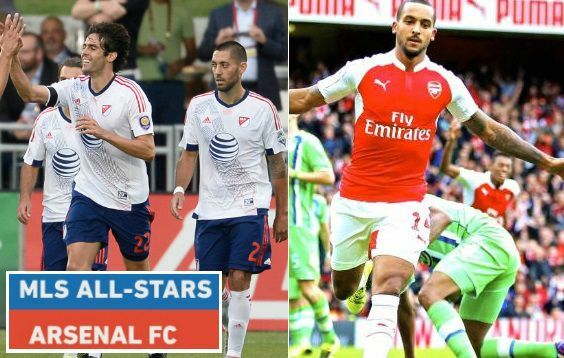 Arsenal are set to take on MLS All Stars in first of two friendlies scheduled on the tour of United States. They will play MLS All Stars on Thursday night, 28th July 2016 followed by friendly against Mexican side Chivas de Guadalajara on 31st July. MLS All Stars game will be played at the Avaya Stadium and will kickoff at around 08:00 p.m ET / 01:30 am uk time. MLS All Stars match is a scheduled every year during pre-season where best talent from MLS lineup together to face a European team. Last year it was Tottenham and this year Arsenal will play in much coveted friendly in San Jose. 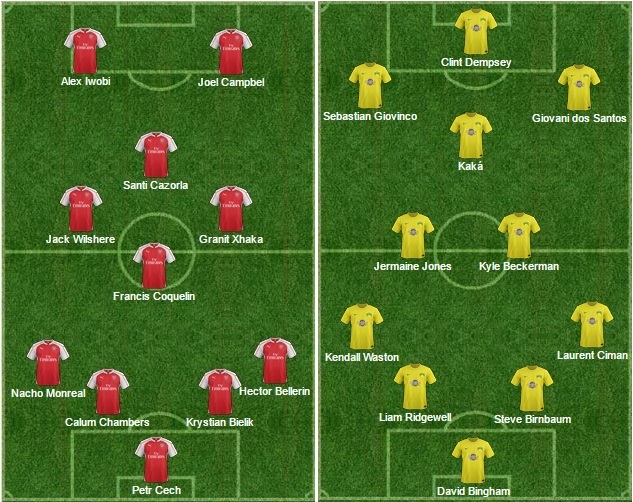 Arsenal has taken a full strength squad to the US tour while MLS has announced 26 man squad which include the likes of Giovani Dos Santos, Didier Drogba, Kaka, David Villa and Pirlo are selected in high profile friendly. Recent MLS All Star Games: Although players are drafted in on a short notice, MLS All Star team usually put up good shows in what has become a traditional pre-season classic. Last year they defeated Tottenham 2-1 while they also go the better of German Champions Bayern Munich back in 2014. Gunners do have most of their top players to choose from including the new signing of Granit Xhaka who is expected to start in midfield alongside fit again Jack Wilshere. Joel Campbell and Alex Iwobi will play upfront in the absense of Giroud and Sanches who are both given extended rest after their long international summer. MLS on the other hand will start with american top scorer Dempsey upfront while Drogba and David Villa are likely to settle for a place on the bench. Giovinco, Dos Santos and Kaka to play attacking roles while Jermaine Jones and Beckerman should start in midfield. Match Highlights: The game will be broadcasted live by Fox in the United States but if you are located in the UK, you can watch live action of the match on SkySports 2 starting at around 00:30 uk time. We will have match highlights of this game right here after the game is over.